In a country devoid of any immense scientific development, we have been a cutting edge software development company since 2000. 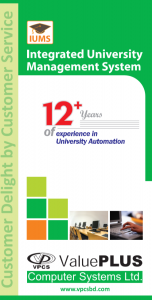 We are particularly specialized in automation of Universities, Yarn Dyeing Mills and Knit Composite Factories.Our motto is “Customer Delight by Customer Service” which we follow intensely to commit ourselves in providing quality customer service. Agreement with FRENCH FASHIONS KNITTING PVT. LTD. Recently ValuePLUS has signed an agreement with FRENCH FASHIONS KNITTING PVT. LTD. Under the agreement we will deploy BusinessPLUS Enterprise (an ERP solution for manufacturing companies) for them. FRENCH FASHIONS KNITTING PVT. LTD. is part of Montagut group, whose history dates back to 1880, when Adolphe Tinland founded a silk yarn factory in the small town of Saint Sauveur de Montagut in the south of France. 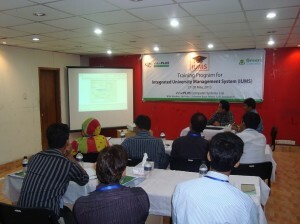 Recently ValuePLUS has signed an agreement with Green University of Bangladesh for implementing IUMS. As part of the implementation, a whole-day training workshop was organized. Employees from different departments took part in the training. GUB already went live with IUMS with some critical modules.